*The product contains naturally present sugars. **The raw material used is milk, not a dairy by-product. Zero Shake is a practical and ready to drink milk protein concentrate that you only need to shake before consumption.This new protein product that you can take quickly and easily is available now in 330 ml packaging. You can take it with you anywhere, it can become a permanent element of your gym bag, the ritual you follow each morning and it fits into a ladies’ bag, too. If quality protein intake is important for you because you do sports, want to bulk or get more shapely, Zero Shake – that contains 25 g protein per serving – is an excellent choice. Its basic ingredient is Milk Protein Concentrate*, which is made of milk and not of dairy by-products. FLAVOURED MILK DRINK? ZERO SHAKE! 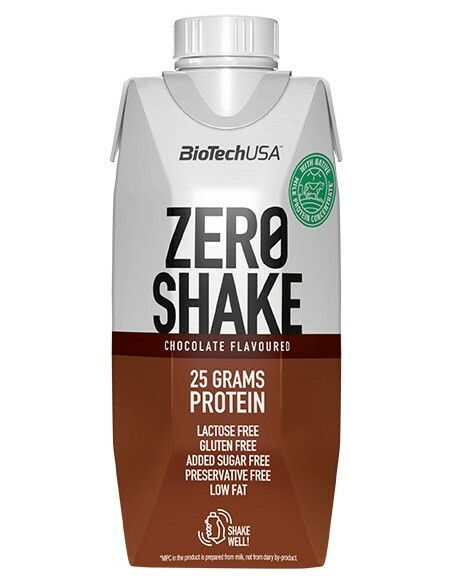 Zero Shake that is available in chocolate, chocolate-caramel and chocolate-cappuccino flavours, could become your favourite if you like flavoured milk drinks, but you also pay attention to a high quality nutrient intake. Zero Shake contains no added, only naturally occurring sugars, it has a low fat content (0.5 M/M%), and it is also lactose- and gluten-free. 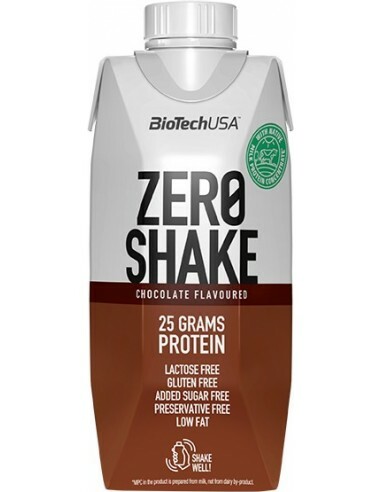 Like all BioTechUSA products, Zero Shake consists of safe and carefully selected ingredients. Shake it well and drink! Shake it well and drink! Storage: Store in cool, dry place. No refrigeration is required before opening. Store chilled once open and consume it within 1 day. Water, milk protein concentrate powder 9.4%, fat-reduced cocoapowder, flavourings, emulsifier:lecithins, sweetener (sucralose),salt, stabilizer (carrageenan), acidityregulator (sodium phosphates). Contains naturally occurring sugars. Lactosefree: <0.1g lactose/100 ml.